Sorry for the leave of absence. Erik and I went on a cruise to celebrate our anniversary and we have been trying to catch back up with life. 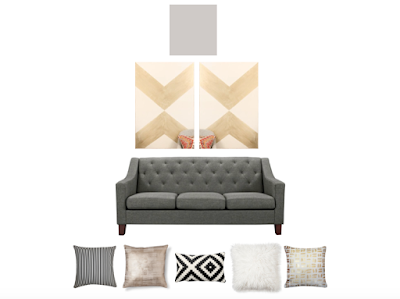 For today's Makeover Monday post I wanted to show you a peak of what we want our living room to look like. Our living room is the first room you see once you enter the house so we are making it our priority. This is going to be the "fancy room" or as our family called it the "Home Teacher" room because we only used it when the Home Teachers came over once a month. The color scheme is very simple. Gray, black, white, gold with some pops of pink for color. I love the classic feel of these colors and the pinch of pink makes it fun. This is the set up of the first wall you see. We have a gray couch against a light gray wall. To break up the the wall of gray there are two canvases painted with a gold chevron design. I found the gold chevron canvas on Pinterest and fell in love. I learned that it was actually a DIY and put it to the test. It was so easy and cheap to recreate. I will post a tutorial soon! To top it all off we have some different textured pillows that bring in the rest of the rooms colors. We still have a few things to do before we have the room is looking like this but I will make sure to show you once it's done. Did/do you have a designated "fancy room" in your home?